Glass components are connected with one another by flanged joints. All the glass nozzles have special ends known as buttress ends to fix up a backing flange behind the end and connect the two opposite flanges by bolting with each other. Coring usually gives tapered buttress ends (GARG type) which are backed by a metal flange with matching tapered bore and with a soft asbestos insert in between to prevent excessive point stresses on the glass surface. These joints give excellent performance when the glass and metal tapers are perfectly matched with full concentricity and when the alignment is perfect. In case of sight imperfection, there is a chance of excessive stresses and breakage of glass neck. Secondly, because of the taper fit, the glass to flange joint is mechanically locked and it is difficult to change flanges. We give another type of end which we call collared buttress end. This is similar to stub ends used in copper and stainless steel piping. The collar is backed by an asbestos rope, a metal split ring and a metal backing flange. This type of joint is very strong and has flexibility in case of slight misalignment. The overall dimensions of this type of end are kept same as those of tapered end. Hence it is easy top interchange these types of ends; and even fixing tapered end with collared end is possible. These flanges are used to couple a glass ends to glass ends or to a below.Backing flanges are made up of cast iron and are used with inserts.They can normally be supplied in various grades of stainless steel on special order. Two types of inserts are used depending upon the type of buttress ends and the backing flange. 1. Type A : For tapered buttress ends, asbestos gasket arcs are used for fitting between the tapered end and the flange. 2. Type B : For collared buttress ends, Cast iron split rings with thin asbestos rope are used & as backing rings between collar and the flange. These flanges are used for coupling the glass components with other equipments or pipe lines. For this purpose, the drillings on the adaptor flanges are as per desired standards namely BS 10 Table E, Table F or ASA 150. For the flanges, specify as follows. Compression springs are used to set and maintain the correct bolt load on standard glass couplings. Standard compression springs have corrosion resistant coating and are also available in stainless steel. 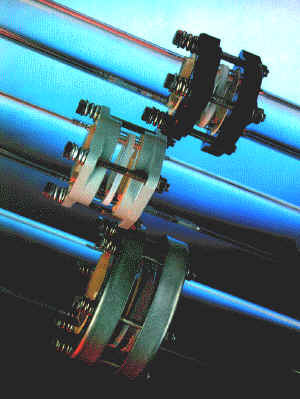 PTFE Bellows are important components in glass piping. They take care of slight misalignment and thermal expansion as well as mechanical stresses. They even absorb vibrations. Hence, they are invariably used in connecting glass components with other non-glass equipments. The PTFE Bellows have built in 'O' Ring and hence no other gasket is required in the use. They can be supplied with split rings and flanges with suitable drillings. These bellows are made stronger to withstand vaccum. Inner sleeves are also supplied for these bellows on special order.